the laser energy that enters the LaserSaber is first diffused by a built-in optical element. 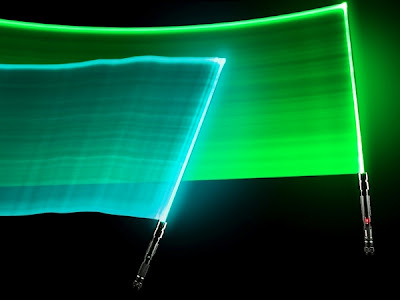 Then the diffused laser enters the internal diffuser tube, which distributes the laser's energy evenly along the blade. Blah blah blah: basically, it powers up like a lightsaber, it leaves light trails like a light saber, the thing is a frickin' light saber. EXCEPT... you can't USE it like a light saber. I was watching the official video (below) and they totally had me until they said a long disclaimer which basically said, you can own it, you can hold it, you can wave it, but no fighting or hitting anything because you could injure people or things. NO LIGHT SABER FIGHTS WITH YOUR LIGHT SABER. I mean, what's the point of having a real honest-to-goodness Jedi-looking light saber if you can't play like an honest-to-goodness Jedi? Seriously, someone needs to figure this one out because this was almost the kewlest thing ever. But not quite. What do you think, would you get one regardless?